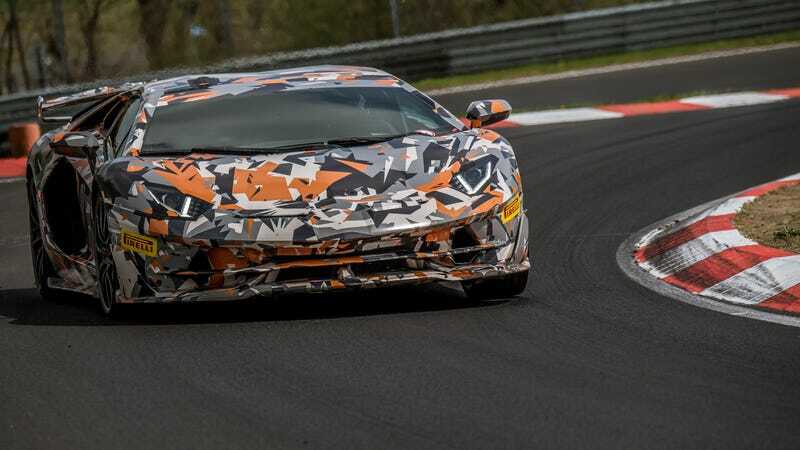 If you are of the opinion that Nürburgring production lap records are Good and Important, then you should know that Lamborghini just set a new one with the yet-to-be-unveiled Aventador SVJ. That lap time was 6:44.97. And it’s made absolutely, 100 percent sure that none of you idiots will dispute the lap this time. If you’ll remember, the last time Lamborghini set a production car lap, it was with the Lamborghini Huracán LP 640-4 Performante. And people were Mad Online about it, busying themselves with analyzing the public data and making claims that Lamborghini falsified the time. It’s true that the Huracán was wearing unique tires for the lap, but Lamborghini proved that it did indeed set the lap time by releasing the full GPS telemetry of the debated run. The challenge was managed by Lamborghini’s Research and Development team, with extensive tire support from Pirelli technicians and driver. Fitted with cameras inside and out and full telemetry, under the formal scrutiny of Remak personnel who managed time and GPS certification using VBOX-Racelogic instrumentation, the lap attempt of the Aventador SVJ was performed during an exclusive session on the Nürburgring Nordschleife. Cameras! Witnesses! Telemetry! Instruments! Certification! It’s all there! The Avendator SVJ beats the Porsche 911 GT2 RS’s production lap time of 6:47.3. And I’m gleeful thinking about Porsche being pissed about this, despite stating in the past that it’s not really concerned with being the One True Ring King. Yeah, okay. It’s all whatever, because someone’s going to come out with an even faster something and we’ll all be back here doing the same thing again soon enough. Until next time. Update 1:23 p.m.: Lamborghini finally uploaded video of the lap.